In my almost 4 years of blogging I have set up MANY blogs. My first blog was far from successful and there are many reasons for that but I strongly believe that using the wrong website host was part of the problem. Just like when building a house, you want a strong foundation and materials that will withstand the elements. SiteGround offers that sense of security and more. Continue reading to learn why I love SiteGround to host all of my websites. *DISCLOSURE* This post contains affiliate links. I will receive a small commission if you purchase from these links, at no extra cost to you. All of my suggestions and opinions are 100% honest. You can read more about this on my Disclosure Page. 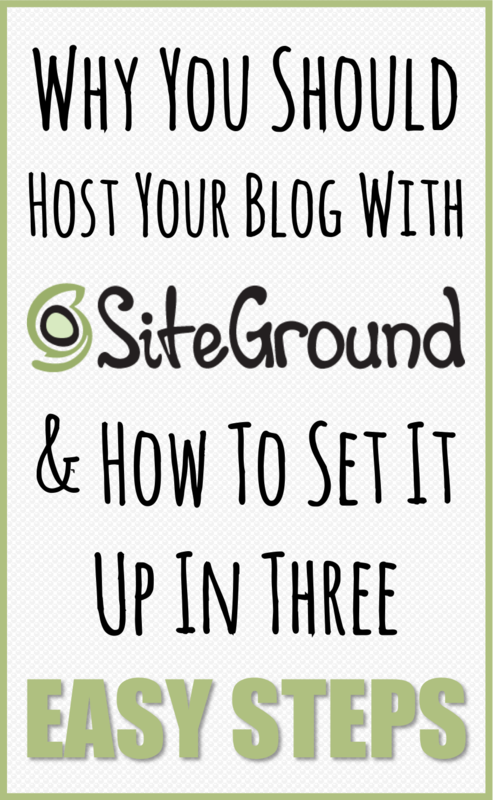 Setting up a blog or any website with SiteGround could not be easier. You can do it in 3 super easy steps and it will take you less than 10 minutes! See the screenshot tutorial below for how to do it. SiteGround is by far the easiest to set up of the hosts I’ve tried (unfortunately, I tried a few before finding it). I’m as tech savvy as any average 26 year old stay at home mom. My technical knowledge is pretty basic but SiteGround makes maintaining website hosting very easy. I haven’t had any real issues with SiteGround (my websites with SiteGround have NEVER been down since I started them) but when I want to do something (like access my sites email or add another blog to my account) customer service is so helpful and easy to get this information from them. As I mentioned above, I have never had any issues with my site going down or any malicious attacks on my websites with SiteGround. In the year I hosted with Bluehost, my site went down several times and they would give no support or explanation. For the most part I would have to wait it out and miss out on all the traffic I could have gained in the down time. This has never been an issue with SiteGround and I have every confidence that if my site did go down, the customer service representatives would help me get it back up quickly and help me figure out why it happened. Just because several bloggers post about something, singing it’s praises, doesn’t mean it’s the only thing out there. It also ABSOLUTELY does not mean it’s the best. You’ll see bloggers recommending each and every host for their own reasons but make sure you look at what you need in your site.  As I have shown you, SiteGround is simple, straightforward, supportive, and EASY hosting for bloggers like you and me who don’t have endless resources and technical back up. If you want to start a blog, either for fun as a hobby or to replace your income and change your life, it starts with getting the proper hosting. I’ve heard good and bad about most web hosts but SiteGround is the only one where all I could find is good. 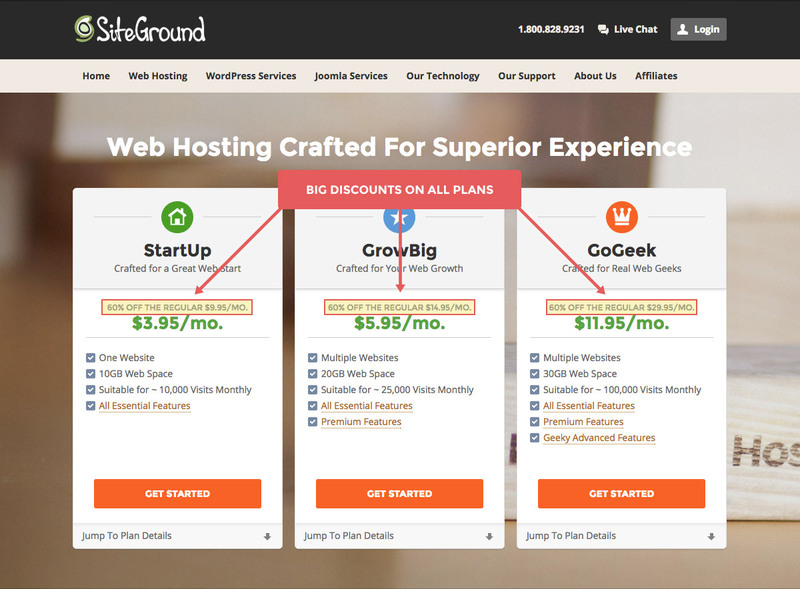 SiteGround has three plans and you will get an awesome discount for any of them through my affiliate links. The GoGeek plan is ideal for people with e-commerce and larger sites, or more technical development needs. You can buy a new domain, or sign up with an existing domain. 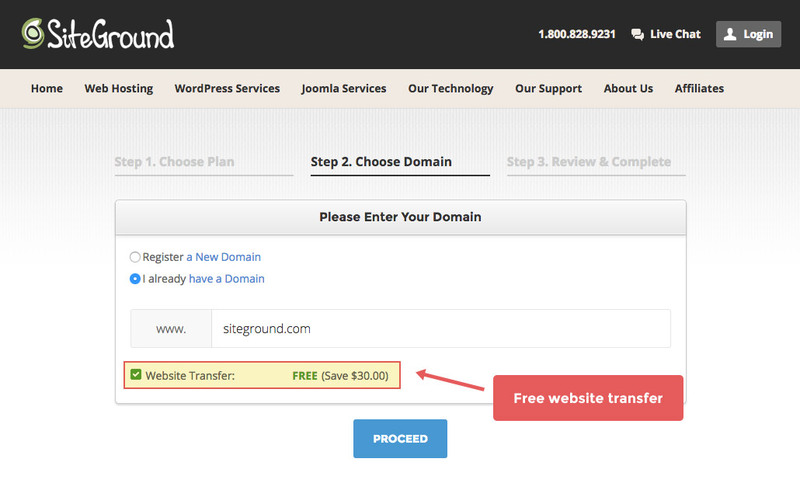 If you do already have a domain that you want to transfer, the GrowBig and GoGeek plans include free website transfer. That is an awesome feature and honestly I wish I would have gone for GrowBig from the get go because transferring my site was a nightmare! 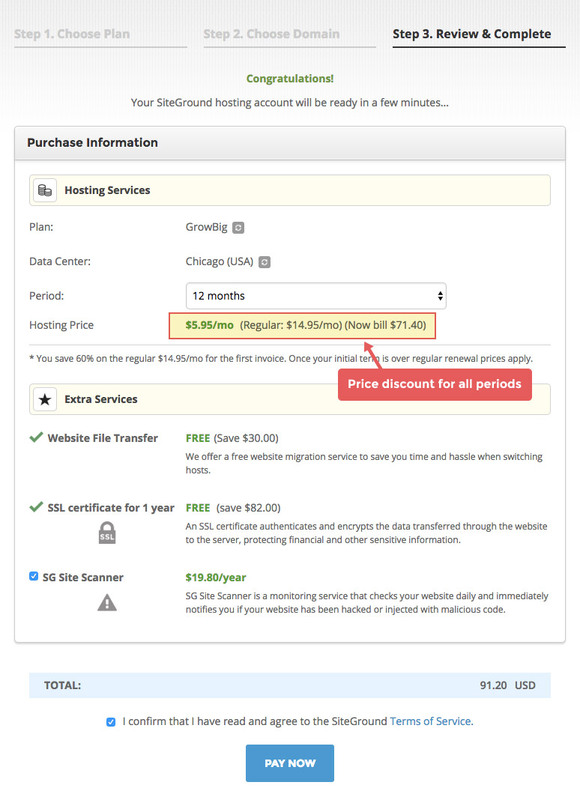 Unlike numerous other website hosting providers, the discount you’ll get from signing up through my links applies to any of the initial periods chosen during the sign up process. This means you can get the StartUp plan at $3.95/month FOR A WHOLE YEAR if you pay for the whole year all at once. I took advantage of the lower rate and I think any blogger starting out should if they can. When starting a blog, each expense is so challenging since you’re not making money yet but look at it as an investment in your future and in your self. Let the cost be your commitment to making this work! In the long run it’s better for you and for your blog to commit to the rate for the whole year and either save the money or put it towards other investments like a killer blog theme. It’s that easy! I hope I gave you all the information you need to help you decide which website host to choose and, if you choose SiteGround, wish hosting plan is best for you. If you have any other questions, comments, or just want to chat about web hosting, comment below, email me, or find me on Facebook!